iOS 7 update is finally here, if you haven’t done so already, do check for an over the air update on a compatible iOS device – iPhone 4 and newer, iPad 2 and newer, iPad mini, and 5th generation iPod touch. On top of a brand new interface that you either love or hate, it looks like Apple has given its App Store a minor update, allowing users to download apps up to 100MB over cellular network; before this, the limit was caps to only 50MB. It was only about a year and a half ago when Apple increased the limit from 25MB to 50MB but I guess with the number of apps increasing that are catered for bigger Retina displays and of course, the new 64-bit processor on the iPhone 5S, Apple has no choice but to increase the limit again. This definitely is a piece of good news, especially if you are those who wait patiently for an app to become free during special occasions like Christmas. 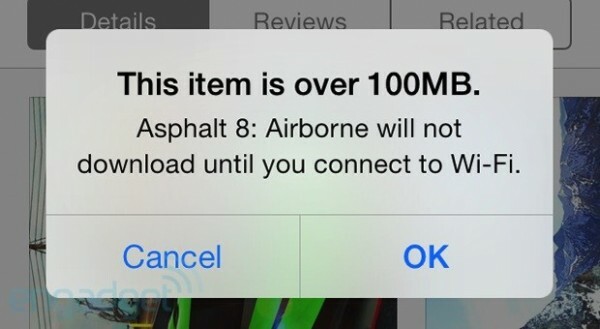 Any apps that are greater than 100MB will have to be downloaded via Wi-Fi.